Istanbul (HAN) January 23, 2015- Public diplomacy and Regional Infrastructure Investment News. By. Joe Parkinson in Istanbul. A suicide car bomber killed at least six people in Somalia’s capital on Thursday, police said, in an attack apparently aimed at a Turkish government convoy in town ahead of a presidential visit. Speaking from the World Economic Forum in Davos, Turkish Prime Minister Ahmet Davutoglu said Ankara was investigating whether the blast was a deliberate attack on the country’s interests, but insisted Mr. Erdogan would press ahead with plans to visit Mogadishu. A Turkish presidential official said they wouldn’t share any details of Mr. Erdogan’s program for security reasons. 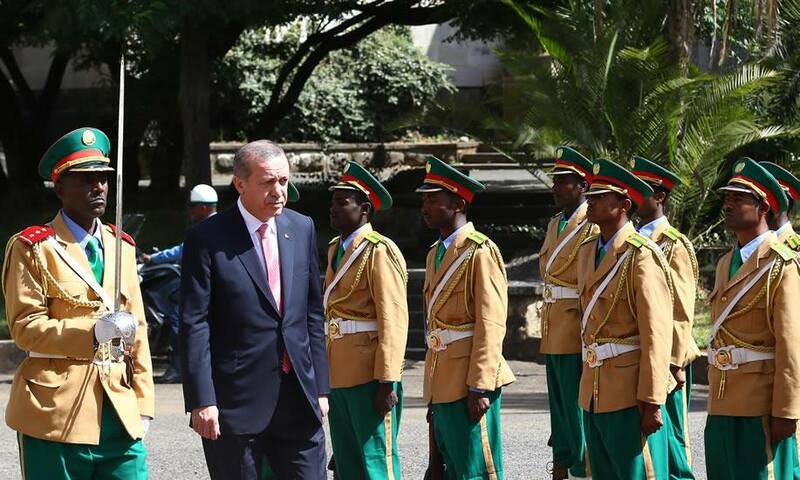 The Car Bomb strike came the day before Turkish President Recep Tayyip Erdogan is set to arrive in the turbulent East African country. Turkey has invested heavily in Somalia’s infrastructure, betting the projects could help guide an economic turnaround there. Turkish officials said Mr. Erdogan was planning to visit several projects in the capital funded by Turkish aid, including a new airport, seaport and hospital. Turkey has played a leading role in bankrolling Somalia’s reconstruction. The militant group al-Shabaab, which accuses Ankara of spreading secularism in Somalia, claimed responsibility for the attack. 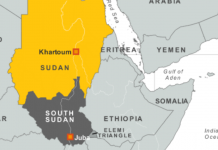 Ali Mohamud Rage, a spokesman for the group, said Turkish officials were specifically targeted. A car loaded with explosives rammed a convoy transporting Turkish foreign ministry officials around 2:45 p.m. local time, said Somali police spokesman Col. Qasim Roble. 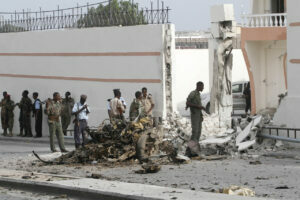 He said five Somali policemen, one civilian and the attacker were killed. No Turkish nationals were among the fatalities, he said. The attack occurred at the front gate of a new hotel called SYL near the presidential compound, home to number of Somali government ministers and where visiting foreign diplomats, including members of the Turkish delegation currently in Mogadishu, are staying. The Turkish president is scheduled to visit the hotel on Friday. “It was a barbaric attack and it will not frighten us from going forward,” Somali Prime Minister Omar Abdirashid said after visiting the site. A Somali minister who was inside the hotel at the time of the attack said the explosion ripped through its front entrance. “I am safe but I can see dead bodies, and the wall of the front gate of my hotel is totally down,” said Mohamed Muktar, the minister for fisheries and marine resources. Thursday’s blast came hours after Turkish media reported that Mogadishu had been locked down ahead of the visit, with a key highway linking the airport to the city center sealed off.